Where can I catch a bus to the World's Fair? Sometimes on a Saturday morning, I get up real early, head over to Flushing Meadows and wait for a bus that never comes. A bus that will take me back to a place that to most kids today, would probably remind them of DisneyWorld, but in reality was anything but. 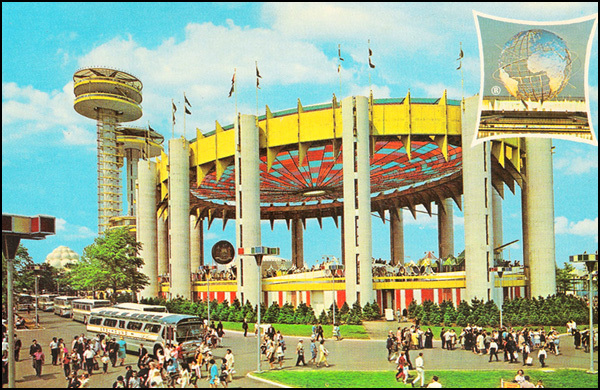 The 1964-65 New York World's Fair was held at the right time in human history. We still maintained a bit of American innocence, but at the same time were awakening to the buzz of modern technology and the fast approaching consumer culture. So where is my bus? Answer is simple. To me, the World's Fair never ended. I see the thousands making their way up the ramp over the Long Island Expressway. I can see the old rusted elevators of the New York State Pavillion suddenly moving again, giving some lucky passengers a birds eye view of the future. This is one of my favorite structures, still standing, it's futuristic, Jetson's style towers, just waiting for George to drop off Elroy. They stand now derelict, rotting, with the echoes of many voices, the sounds of many footsteps. So, is this bus coming or what? Flushing Meadow Park used to be a garbage dump you know. It was used to collect all the ash and refuse from Brooklyn and Queens. Legend has it that one particular garbage mound was so high, they called it "Mount Corona". Stories speak of rats the size of big cats, unless there was just one big cat there that ate all the rats! So why am I so fascinated with this place? Maybe it's because for two magic seasons during the sixties, dinosaurs roamed the meadows, an actual atomic fusion was performed here, Disney showed us that "There's a great big, beautiful tomorrow" with his exhibits and where else could you experience the delight of the Belgian Waffle, outside of Belgium of course. Well, my bus just pulled up and as I get on, I can't believe how much fun I'm going to have today at the New York World's Fair. Care to join me?